Sarajevo - unique symbol of universal multiculture - continual open city is part of the Tentative list of Bosnia Herzegovina in order to qualify for inclusion in the World Heritage List. Sarajevo is a perfect example of a city that seamlessly blends cultures, history, architecture and an unfortunately often sad history. It's place in modern history and the resilency of its people during the brutal breakup of Yugoslavia are ample reason for inscription. c - there are so many "double" entries from the same countries on the List already, think of the Mexican colonial city centers or (a more recent visit of mine) Studenica and Sopocani monasteries in Serbia; why would it be a problem to inscribe the Top 2-heritage sites in Bosnia? So I think it deserves a second chance. It's a great city to stay in for a while, wander around, taste the food and enjoy the oriental atmosphere of the bazaar area which looks like a small version of Istanbul. The rest of the city is high on Austro-Hungarian constructions and reminders of what happened here in 1914, 1984 (Olympics) and 1992-1996. I took a 3.5 hour walking tour with a local guide, which was a very enjoyable introduction to all the stories that can be told about this historical city. A definite must see for history buffs and those who enjoy oriental cities. 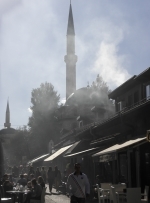 The old center of Sarajevo is an architectural, cultural and sensory delight. The presence of turn-of-the century art nouveau/art deco decorated buildings with Austrian-Hungarian styles; the beautiful mosques and small bazaars with their reminders of the Ottoman heritage; and finally the great mixture of people with a wide range of traditional and modern dress and appearance and the smells of roasting meats- all together makes for an unforgetable experience.